In the two and half years since the first MacBook model, Apple has tweaked and improved its consumer-level laptop line three times. But the latest (fourth) version is a giant leap for the MacBook, compared to the baby steps of the earlier updates. With the latest design (both inside and out), the MacBook has become a lot more like a MacBook Pro mini. What’s most noticeable about the new MacBook is its design. Apple ditched the MacBook’s white (or black) polycarbonate case for one made of precision-crafted aluminum, the same case design used in the new MacBook Pro. The result is a sleeker, more rounded design; when closed, it looks very svelte, even though the MacBook is only 0.13 inches thinner than its predecessor (the very thin top of the MacBook looks like that of the MacBook Air ( ). It also shaves half a pound off the previous MacBook’s five-pound weight; the difference is definitely noticeable and makes the MacBook just a little more portable. Even though the case is made of metal, the MacBook didn’t get hot during my testing. Typing most of this review on a 2.4GHz model resting on my lap was not in the least bit uncomfortable and the fans didn’t kick in once. The new MacBook features an aluminum body, a new trackpad, and a backlit LED screen. The keyboard is similar to previous MacBooks, but the keys are black across both aluminum models; previously, only the black MacBook had black keys. The keys are easy to type on and have a nice, springy response to them. The high-end MacBook even includes a backlit keyboard, a first on the MacBook line. Apple also moved the battery indicator lights to the front left side rather than on the bottom, so you don’t need to flip the MacBook over to see the remaining charge (it also indicates when the battery is missing). And speaking of batteries, Apple has redesigned the battery itself and how you access it. On the previous MacBook, the back of the battery could be seen as a panel at the bottom of the case, and you needed to unlock the battery by turning a lock with a coin or screwdriver. The battery in the new MacBook is housed underneath a thin metal door that unlocks with the flick of a latch. Remove the door and you have quick access to the battery, as well as the hard drive (a single screw keeps the drive in place) and RAM (after removing eight other screws). Apple claims five hours of battery life for the new MacBooks, which Apple measures by wirelessly browsing Web sites and editing text in a word processing document with display brightness set to 50 percent. In our testing, battery life was 2 hours and 35 minutes for the 2.0GHz model and 2 hours and 33 minutes for the 2.4GHz model; we tested for watching a movie on an airplane, playing a movie clip in QuickTime ripped from a DVD to the laptop’s hard drive. We played the movie at full screen with brightness set to maximum. Although you can’t directly compare Apple’s numbers and ours, both MacBooks lasted a little longer than the new MacBook Pro models, even when running the MacBook Pros with the 9400M graphics processor (the more battery-conserving option). 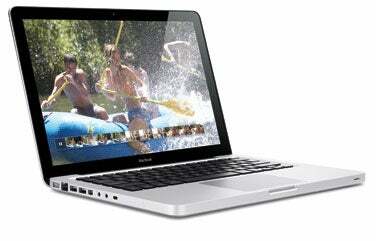 The previous white plastic 2.1GHz MacBook, however, beat the new MacBooks in battery life, lasting nearly 3 hours. Apple moved the stereo speakers underneath the keyboard and I expected the sound to suffer. But music played in iTunes was surprisingly loud and clear, and hiding the speakers has the effect of making the sound seem like it’s coming from the whole computer rather than from a portion of it. The speakers are some of the best I’ve heard on an Apple laptop. Also, the iSight camera and its microphone are now separated. The camera is centered at the top of the display, and the mic moves next to the keyboard. Although the mic is therefore closer to the keyboard, Apple says it has built noise reduction into the microphone (it’s on all the time) to reduce ambient noise pick up. In a video chat with a friend 400 miles away, the camera and mic performed very well, and a recording of my voice using QuickTime Player didn’t pick up any unwanted hum or hard drive noise. The next major change from previous MacBooks is the display. Although the MacBook has the same 13.3-inch size screen and 1,280-by-800 pixel resolution as the previous models, these are the first MacBooks to use a backlit LED (light-emitting diode) display. Compared to the screens on the previous MacBook, the new backlit LEDs are thinner, brighter, and more power-efficient. Resting over the face of the display is a piece of glass with a roughly three-quarters-of-an-inch-thick black mask that replaces the bezel of old (the overall black-and-silver color scheme gives the MacBook a strong kinship with the iMac). Apple says that the flat pane of glass and curved aluminum top provide sufficient strength to protect the screen, and the solid feel to the construction seems to back that up. I was also impressed with how well the glass resisted fingerprints as I ran my fingers over it. Unlike my iPhone, which requires near daily rubdowns from the soft black cloth that comes in the box, I didn’t need to wipe off the MacBook at all in my use (there is a cloth included in the MacBook box, however). A point of contention often brought up when it comes to displays is gloss. Some complain about seeing reflections in glossy screens, interfering with usability. Other lament the glare coming off the glass. Still others say glossy displays are unfit for high-end color work in graphics or video. Whether or not you like a glossy screen is a personal decision, but the LED display used in the MacBook is very bright, which tends to mitigate glare or reflectivity issues. Also, with a laptop you can adjust the angle and position of your computer in such a way to overcome many potential problems. But the lack of a matte option, for many, is a deal-breaker. In terms of viewing angle, the MacBook’s display performs well, with very little color shift or change in brightness, when viewed from side to side. Looking at the screen from above or below has more of an impact, changing color and contrast dramatically. You may not know by touching it that the trackpad on the newest MacBooks is a piece of glass, coated with a textured material to match the look (but not feel) of the aluminum body of the MacBook. It’s smoother than the case, but strikes a nice balance so that your fingers glide easily across it, with enough texture to give you some traction. The new trackpad has no button below the trackpad area. The entire trackpad acts as a button, and you can feel the trackpad depress as you push your finger on it to click (there’s a narrow strip near the top that doesn’t move, but otherwise you can click anywhere you want on it). With no separate button, the trackpad is larger overall. The tactile feedback when you press down to click is very helpful, although using the new trackpad does take some getting used to, especially if you’ve been using an Apple laptop in the past. I found myself still using my thumb to click on the trackpad (as I did with the button in my earlier MacBook), which sometimes didn’t work as expected because I had another finger on the trackpad at the same time. Also, it seems to takes a little more force to press down the larger trackpad than the smaller button of old. The new trackpad also supports Multi-Touch, which gives MacBooks users access to multi-finger gestures (demonstrated with videos in the new Trackpad system preference). Like on the MacBook Pro, you can now rotate images with a twist of your fingertips, scroll through photos with three fingers, or use new four-finger gestures, where you can swipe fingers up or down to engage Expose or sideways to bring up OS X’s Application Switcher. You can also designate the bottom left or right corner as a right-click. Once you learn and get used to these gestures, they can save you time and cursor movement. In October 2008, Apple introduced a new MacBook design that housed the company's consumer-friendly laptop into a MacBook Pro-like aluminum enclosure with a large glass trackpad. Graphics have improved with the addition of an Nvidia GeForce 9400m chip. While the integrated graphics continue to share memory with the system RAM, there's more shared (256MB as opposed to 144MB) and it's the faster DDR3 SDRAM. Like the MacBook Air, the MacBook no longer ships with FireWire ports -- just two USB 2.0 ports. This 2.4GHz model does feature a backlit keyboard, which is not available in the other MacBook configurations. In October 2008, Apple introduced a new MacBook design that housed the company's consumer-friendly laptop into a MacBook Pro-like aluminum enclosure with a large glass trackpad. Graphics have improved with the addition of an Nvidia GeForce 9400m chip. While the integrated graphics continue to share memory with the system RAM, there's more shared (256MB as opposed to 144MB) and it's the faster DDR3 SDRAM. Like the MacBook Air, the MacBook no longer ships with FireWire ports -- just two USB 2.0 ports.